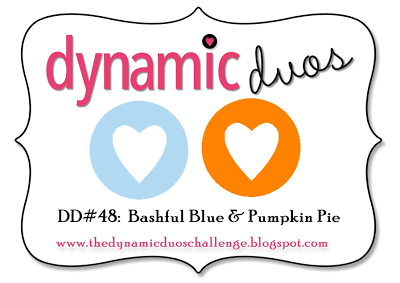 This card was created based off of this week's challenge at Dynamic Duo's - Bashful blue and Pumpkin Pie. Cardstock and impression plate from PTI, button diecut and stamped sentiment from MFT, misc. embroidery floss. Your card is really cute...and very creative...great job with the color challenge! Congrats on a successful bridal shower Cathy! Yahoo! Now the big day! I love this little project! Cute sentiment to go along with all those pretty buttons! Super cute, love all the fun buttons!! Thanks so much for joining us this week on the Dynamic Duos challenge.